As noted in the Introduction  to this essay, at the time of the Ring’s conception Wagner was an anarchist revolutionary. Major influences on his thinking included Bakunin, Feuerbach, Hegel, and possibly Marx (though of these only Bakunin was an anarchist). Wagner’s anarchist ideology is readily apparent not just in his early notes on the Ring, but in the finished cycle of operas. In the first draft of the Siegfrieds Tod libretto (see Part One  of this essay), Siegfried enters Valhalla at the drama’s climax, and a sort of anarchist utopia is established on earth. In the 1848 “Sketch” of the Ring, Wagner has Brünnhilde cry to the Nibelungs “Not Alberich shall receive [the ring]; no more shall he enslave you, but he himself be free as ye.” Here we detect an influence of Hegel’s “master-slave dialectic”: the master is actually unfree; he only attains true freedom for himself when all are free. 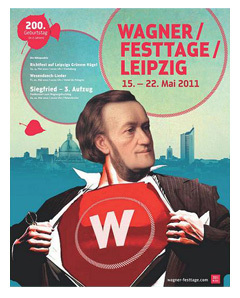 However, as was the case with many anarchists and socialists at the time, Wagner was simultaneously an odd kind of Radical Traditionalist: he believed that the sort of society he wanted to bring about had once existed on earth, in a Golden Age long gone by, when men lived free of gods and masters, and greed and war. Now, we may marvel at the naiveté of this and wish that Wagner had never held this position, but for the moment let us just note that such a tendency, for all its flaws, is quintessentially Western. It is Western both in its intense self-criticism – its radical critique of the present state of Western culture – and in its dream of a perfected, future society. However, Wagner did come to shed this naïve anarchism and to radically reconceive the meaning of his own work. And the event that led to this was his encounter with Arthur Schopenhauer’s World as Will and Representation (published in 1818, 1844). In this work, which is one of the most accessible in all of German philosophy, Schopenhauer argues that the world is a manifestation of an infinite, striving force he called Will. The different species and natural kinds are all “grades of the Will’s manifestation.” These form a hierarchy, which works out to be more or less identical to the “great chain of being” we find in Aristotle, Schelling, and Hegel. At the top, of course, is man, the most perfect objectification of Will. Man is capable of knowing that he is Will – and thus, through man, Will confronts itself. This grand vision, however, is profoundly pessimistic. Schopenhauer thought that when mankind confronted itself as Will – or when Will confronted itself (it comes to the same thing) – the result would be horror and a rejection of life. And Schopenhauer urged that on us. In short, for Wagner the Ring simply ceased to be a clarion call for a better world, a world without greed and power lust. Instead, it became a reflection on the tragic nature of life; on the ineradicability of greed and power lust, and the folly of optimism. And we will see that this is not a case of Wagner simply superimposing a new interpretation on a work already finished. He was, indeed, correct to think that this is the interpretation best supported by the work itself. All who know the work can understand how the unusual wealth of its contents, gathered from every side, and meant almost exclusively for the student, would react upon me, whose mind was everywhere seeking for something definite and distinct. Formed from the scanty fragments of a perished world, of which scarcely any monuments remained recognizable and intact, I here found a heterogeneous building, which at first glance seemed but a rugged rock clothed in straggling brambles. Nothing was finished, only here and there could the slightest resemblance to an architectonic line be traced, so that I often felt tempted to relinquish the thankless task of trying to build from such materials. And yet I was enchained by a wondrous magic. The baldest legend spoke to me of its ancient home, and soon my whole imagination thrilled with images; long-lost forms for which I had sought so eagerly shaped themselves ever more and more clearly into realities that lived again. There rose up soon before my mind a whole world of figures, which revealed themselves as so strangely plastic and primitive, that, when I saw them clearly before me and heard their voices in my heart, I could not account for the almost tangible familiarity and assurance of their demeanor. The effect they produced upon the inner state of my soul I can only describe as an entire rebirth. Just as we feel a tender joy over a child’s first bright smile of recognition, so now my own eyes flashed with rapture as I saw a world, revealed, as it were, by miracle, in which I had hitherto moved blindly as the babe in its mother’s womb. The mythological material Wagner found in Grimm and the traditional sources touched a chord deep in his Germanic soul, and awakened him in new ways. As M. Owen Lee notes, “Like those novelists who tell us that their characters ‘take over’ the writing and determine their own fates, Wagner acknowledged that his Ring was shaping itself from some source beyond his conscious control.” And the main character of the Ring, of course, is Wotan. Essentially, in writing the Ring Wagner came to be possessed by the spirit of Wotan. He wrote to his friend Röckel, another anarchist revolutionary, “I started my poem with an optimistic view of the world . . . and I hardly noticed, when I was outlining it, that I was unconsciously following a quite different and much more profound intuition. I was seeing, not a single moment in the world’s evolution [the supersession of capitalism by anarchistic socialism], but the essence of the world, the world in all of its moments.” In Schopenhauer, Wagner found a vocabulary in terms of which he could interpret this “intuition” – but the intuition did not originate with Schopenhauer. It was borne of Wagner’s study of Germanic myth, and his insight into the “essence of the world” was a product of its spirit. Far apart as may seem the Christian hymnology of the south and the Eddas of the still heathen north, they are alike in the implicit space-endlessness of prosody, rhythmic syntax and imagery. Read the Dies Irae together with the Völuspá, which is little earlier; there is the same adamantine will to overcome and break all resistances of the visible. The Faustian soul is characterized by a solemn inwardness, tending towards solitude and melancholy – but matched by a ceaseless, outward-striving will. European man has always sought to go beyond: to explore, to find adventures in other lands, to conquer, to peer into the mysterious depths of things, to find new ways to control and manipulate his environment. This is not to say that these qualities are never found in other peoples, but – as Spengler recognized – they are most pronounced and developed in Northern European man. We find the Faustian spirit in our gods. Ódhinn is the ceaseless wanderer, and the leader of the wild hunt. From his throne, called Hlidskjalf, he can survey the entire world. His two ravens, Huginn and Muninn (Thought and Memory) fly over the earth, bringing news of all things back to him. But there are secrets concealed even from Ódhinn, and beings (such as the Norns) over which he has no power. Like us, he burns with a desire to know the hidden and to control his fate. So he hung on the windy tree, nights all nine, and won the secret of the runes – the hidden lore that explains all things. He sought wisdom too from Mimir’s well (the well of memory) and sacrificed an eye to drink from it. We are Ódhinn, and he is the embodiment of the Faustian spirit. Wagner wrote to Röckel in 1854: “Observe [Wotan] closely! He resembles us to a tee.” What Wagner means here is that Wotan represents “modern man” (he goes on to describe Wotan as “the sum total of present-day intelligence,” and to contrast him with Siegfried, who is the “man of the future”). But here Wagner falls into the unconscious universalism that is characteristic of Western thinkers: the tendency to project Western features onto humanity as a whole. Obviously, however, Wotan does not resemble “modern man” in, for example, the China, India, or Africa of 1854 (or even of today). In a similarly universalistic vein, Lee writes that “Wotan represents not so much the notion of God as what there is in man that has godlike potential.” But this is not fully accurate either. What Wotan represents is the striving of Western man for the infinite, for the transcendence of all boundaries; his striving, indeed, to become God. Wotan represents human consciousness in its Faustian inflection: the restless search for total knowledge, coupled with the desire to manipulate and to control all of nature. These are two sides of the same coin. But what Wotan depicts above all else is Faustian, Western man achieving self-consciousness: coming to full awareness of his nature – and willing his own end. Cooke notes that “it has been mainly Europeans, or men of European origin, who have dominated and despoiled nature on a large scale; and in The Rhinegold Wagner was adapting North European myths to present an artistic diagnosis of the ills of European civilization.” Before we react in knee-jerk fashion against this seemingly “anti-Western” statement of Cooke’s, let us just pause to note that he is right. Yet where climatic nature draws man beneath the all-sheltering influence of her rankest prodigality, and rocks him in her bosom as a mother rocks her child,—where we must therefore place the cradle of newborn mankind—there has man remained a child forever—as in the tropics,—with all an infant’s good and evil qualities. First where she drew this all-conditioning, over-tender influence back, when she handed man, like a prudent mother her adult son, to himself and his own free self-devisings,—where man, then, mid the waning warmth of the directly fostering care of climate, was forced to cater for himself,—do we see him ripening to the full unfoldment of his being. Only through the force of such a Need as surrounding Nature did not, like an over-careful mother, both listen for and still at once ere it had scarcely risen, but for whose appeasement he must himself provide, did he gain consciousness not only of that need but also of his power. This consciousness he reached through learning the distinction between himself and from whom he now must wrest it, became the object of his observation, inquiry, and dominion. And so it is Wagner’s view that it is primarily European man who succeeded in separating himself from nature – and who then turned on nature, so to speak, and sought to dominate her. Thus, if Wotan represents this aspect of “man,” it is truly European man that is meant here. Wagner is critical of this Western “will to power,” but he also seems to be aware that it is the source of all of our achievements. The early Wagner sought to reform the West; to heal the division Western man had made between himself and nature. The later Wagner saw our nature as inherently tragic, and offered, as we shall see, a different answer. And of course, Wagner was strongly influenced by Greek drama, in which the tragic nature of (Western) man is central. Oedipus, for example, represents the Western spirit: striving ceaselessly and heedlessly to know, until he is destroyed by knowing. Wotan – Western man – is the tragic character of the Ring, and his tragic flaw is his restless, and reckless pursuit of knowledge and power. For more information see my review of Ricardo Duchesne’s The Uniqueness of Western Civilization (Leiden-Boston: Brill, 2011): https://www.counter-currents.com/2013/04/ricardo-duchesnes-the-uniqueness-of-western-civilization/  . Or better yet see the book itself. See Arthur Schopenhauer, The World as Will and Representation, Vol. 1, trans. E.F.J. Payne (Mineola, New York: Dover Publications, 1969), see especially pages 153-154. The Idea that through man Will confronts itself is implicit in Schopenhauer’s theory of art. Quoted in M. Owen Lee, Wagner’s Ring: Turning the Sky Around (New York: Limelight Editions, 1998), 53. Richard Wagner, My Life, trans. Andrew Gray (New York: Da Capo Press, 1992), 260. See also my review of Ricardo Duchesne’s The Uniqueness of Western Civilization (Leiden-Boston: Brill, 2011): https://www.counter-currents.com/2013/04/ricardo-duchesnes-the-uniqueness-of-western-civilization/  . Selected Letters of Richard Wagner, trans. Stewart Spencer and Barry Millington (New York: W.W. Norton, 1988), 308. Lee, 56-57. In a way, Lee inadvertently hits on a very important point made by Edred Thosson: that the “Odinist” does not worship Odin; instead, he strives to become him. Cooke, 252. Italics in original.